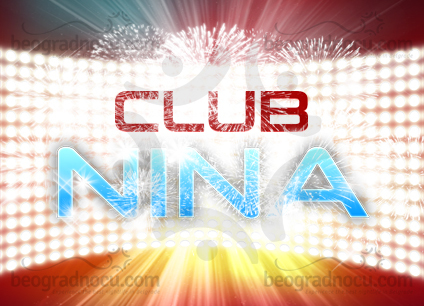 Club Nina that is located at No 405a Bulevar Kralja Aleksandra Street will fulfil all your desires. This place of most quality folk music can accommodate 250 people and it's opened from 11 pm until 4 am. Club Nina is perfect place for everyone who wants a quality entertainment and dancing with best songs until early in the morning. When we talk about interior of this place, it will delight you at first sight, since is very tastefully decorated. Management of this club has thought about everything, so your desires will be fulfilled. Prices are very affordable and service is high quality. You will love staff and musicians in club Nina and you will feel like you have found second home. Club Nina has tables and booths, but wherever you are you are always in center of attention. If you want to celebrate some important dates in your life you can celebrate here in club Nina and you can receive more than you ever wanted. When you come to club Nina for the first time, you will tell everyone about party in here. People who go out here know how to to recognise true quality, know that club Nina is just the right choice for them. Musicians in club Nina will make your time here unforgettable and you will always have a reason to come back. You will wait sunrise in club Nina listening to most popular folk songs. Here you will meet people and have adventures you will remember. Do not hesitate and wherever you want come to club Nina because you time spent here you will always remember.